“Seventy-five years from now, that house will be something where you can say: ‘That’s early-2000s architecture. That was when architecture started to change,’” he said. Finally, an infill house that reflect its time in design and materials. No more Phony-Colonie, faux historic, inauthentic architecture. Keep the old, but don’t build new to look old. This is so refreshing. I sure hope that’s not representative of 2015-2016. Beauty is in the eye of the beholder…I’m trying to find the beauty. Beautiful, but I doubt that the building will really last 75-100 years with those building methods. Modern building methods are designed to be good enough for disposable buildings, not permanent ones. It really does look sharp though. Not a fan. While I strongly prefer a *well executed* faux historic new construction over this I understand reasonable people may differ on such matters of aesthetics. That said, one of the great things about Chimbo/Church hill are all the front porches nestled just a few feet from the sidewalk. Neighbors spending time on the front porch fosters community in an organic way. 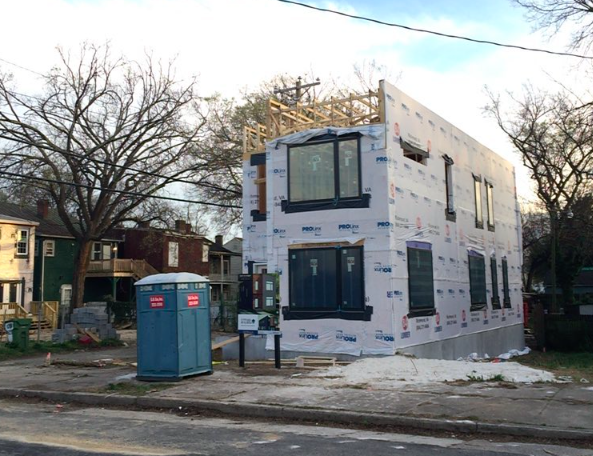 It would have been nice for these stark modern boxes to have incorporated front porches. @#1 “Phony-Colonie, faux historic, inauthentic architecture” I love it! The thing that says “2015 or so” are the corrugated/seemed metal and the panel systems. The shape makes it look like an old row house / town house that someone “updated in the name of progress.” The shingles and the flat roof make it look like a 1960s/1970s modernist kit/prefab house. I don’t dislike modern architecture (and I suppose this could be considered postmodern, for the mix of references/materials and form) but any warping, ground settlement, water damage, or significant lack of maintenance and I bet this thing will look a lot worse in it’s old age than an old victorian. All the decorative elements on the older homes helped to hide the flaws and inaccuracies – and many originally served functional purposes. So why does this look like it was built in the 1970s? ARCHITECTS OF THE WORLD — THERE IS MORE TO LIFE THAN EMPTY POLYGONS! I imagine that in some years, it’d be renovated to look like an old house. But yeah modern houses are not built to last. If they do make it to 75-100 years, it’d definitely be worth preserving. But I would rather take a properly well-executed “faux historic” house. That is what I’d do if I had a company that built such. They should build whole new neighborhoods of modern houses instead of infill where the architecture clashes. @ Terrie/#14. Fair enough/was not how I read that, lol. I was thinking “someone hasn’t had their coffee yet” but turns out I was the one who was out of it. Historic preservationists are all about architectural authenticity. Building new that looks old is not preservation and not historic. And yes, “colonie” rhymes with “phony.” It’s a favorite phrase of my HP professor in grad school. It makes me chuckle. First, I want to know if the CAR approved this design? So, how does this modern box fit in with the surrounding Victorian architecture? Hey Eric Huff. Read the article. Or do some basic research. CAR doesn’t have jurisdiction over this area. @21 So, it falls in that doughnut hole? Let me look. Does it miss both O&H and Church Hill North or only O&H? @Jeesus… you are correct. I am not infallible but it is a bit confusing. This should fall in what is the O&H Chimborazo district designated in 1987 but it only covers a block away and around the park and not the entire Chimborazo area. It is obviously outdated and should be expanded. I think this design group’s arrogance is what rubs me wrong. That they are going to try and make changes in old historic neighborhoods. True, people buying homes today are not into “formal” living as we are. I am not opposed to this design either. Just that they need to be more mindful of history and its surroundings. Possibly Fulton – Rocketts, which is open for development would be a better option? Or on the fringes of the districts and not plopped in the middle of them? Don’t want what happened at 21st and Broad to happen again which is in O&H. Most preservation, conservation, rehabilitation programs and the like contain a focus on “compatible but differentiated design” and mandates to avoid “faux historicism”. These ideas are routinely applied in a puritanical fashion to renovations, additions, and new construction with sometimes hilariously idiotic outcomes. Most of the guidelines in federal and local preservation programs contain a subtextual modernist bias. For example, if a decorative element is missing from a historic structure, and there is little in the way of evidence from the surrounding buildings and no photographs of what it looked like, many of these preservation programs will not allow you to restore it, or will require it to be replaced with as simple and as blatantly contemporary a substitute as possible. Efforts to use salvage material of appropriate age and type are usually rejected as inappropriate, even though the modern substitute is usually far worse. These sorts of problems seem to be exacerbated by the mix of individuals usually involved with the approval process for new construction or additions in historic districts and for restorations projects. Professional architects who no longer draft plans by hand and are unable to recreate or describe most traditional ornamentation using computer-aided-design programs; bureaucrats who have dogmatic and sometimes bizarre interpretations of program guidelines and prefer precedent to common sense; and individuals with no architectural or historic preservation background more or less ensure that perfectly sensible proposals are routinely denied, while ludicrously inappropriate proposals are often approved. @Juliellen… a neighborhood especially representing a period, should be homogeneous in period and style. Of course a new house is not historic. Mixed period neighborhoods can look ugly… like mine… houses from about 1900, then 1930, 1950s housing project, then 1960s, 1970s apartments.. a church in a 1930s school with 1970s and 1980s additions, then some awful looking suburban 2006 houses. It would look better if the original neighborhood still existed. I would love to protect what’s left because we have a story… we should replace the gaps with houses that look like their neighbors, so if it’s 21st century’s version of late 19th/early 20th century Italianates, I’d take that over sore thumb eyesores. Also, the design looks too minimalist and industrial. Reminds me of a small office building from the 1960s rather than a house. Eric, variety does tell a story. My neighborhood has a mix of houses from the 19th century through 2000s. It’s a wonderful physical story of this place. The M Street project is refreshing. I hope that good modern design continues to evolve in Richmond. I will take more of these than the boarded up wrecks that have been in the neighborhood for decades or the empty lots. Without this development and dare I say things like the Pear Street development or Scotts Additions Towers, there will be never any real estate tax money for schools and bike lanes that people wants. Love it. Finally a sensible infill approach. This is much more appealing than the faux stuff that all too often falls short of the mark (although I have seen some good examples of that, and it’s nice when it’s pulled off in a really excellent way). The neighborhood is and should be a blend of many things. There are houses that are early 19th-century, mid 19th-century, late 19th-century, early 20th-century, and now early 21st-century. Good job! Don’t get me wrong, I totally get the idea about mixture of styles. All we have to do is look around. Our street alone is full of varieties and periods but most styles fall within a 100 year range, not 100 years apart. Then at some point historians decided to put a halt to changing the fabric (look) of historic neighborhoods and maintain the sameness of what we have hence the designated districts and guidelines. The idea is to build infills that reflect the surrounding area to maintain the historic fabric look which this one does not. Those “faux” period houses that miss the mark, I agree in part. But they are not supposed to look exact to the nth degree but have some differences to reference that it is new construction and not be, or as the old buzz word which was running about in length here a few years back, “false historicism”. @25 Lee… I agree and know about the iron fence debacle that Jennie Dotts had to face to be allowed to put back a period correct fence versus some plastic crap from Lowes. And know about “internal influences” within the CAR with what should be considered Conflict of Interest with contractors on board. But don’t totally agree that computer software, especially in this day and age, can’t be adapted to contain elements of historic architecture styles. @26 Cadeho, I also agree. Even if “false historicism” is frowned upon, at least the designs that “missed the mark” were closer in design style within the immediate neighborhood versus some bland slab side house that looks like it came straight out of a 1960s Popular Science magazine. If this isn’t the right place for this house, what is? The builder chose a location outside the regulated Old and Historic districts. If this isn’t appropriate, what is? If someone wants to build something new in a walk-able neighborhood, where do they go? How much of the city needs to be protected from a change in styles? @29 and 30 – Comparing this to the pear street project and pairing off preservation vs. contemporary design creates a false and rather muddled dichotomy. Before I say anything else: I am not adamantly opposed (or, really, opposed at all) to the house on M street. This discussion has veered off in several other directions because various elements of this particular story overlap with so many other concerns. Anyway – density and preservation are not logical opposites, and infill like the house under discussion and high density properties like the project on pear street do not have the same effect on city revenues and expenditures. Historic preservation tends to result in high property values per square foot, especially in neighborhoods where most of the homes have been restored or have a consistent historic character. A project like pear street could have the opposite effect on property values per square foot in the long run, if not the short term. (and speaking holistically – clearly a building os worth more than an empty lot, but there will also be effects on the neighboring properties) However, the size of a building like that proposed for pear street would result in more absolute value because of the greater square footage. However, even if this means that the pear street project would result in higher tax revenue, the building and it’s residents will consume more city services, need more infrastructure, and so forth, which makes it impossible to truthfully and accurately say, off the cuff, that high density infill has one effect on tax revenue available to fund things like schools while low density infill has the opposite effect. The issue is actually one of multiple overlapping tradeoffs: Are historic buildings worth more or less per square foot? Are neighborhoods with a consistent and/or historic architectural style worth more per square foot? How does “luxury” vs. “affordable” factor in (And, over the life cycle of the building, not just immediately)? And what is the practical effect of greater density – does density result in higher or lower property values on average? In the long term? In absolute terms? Do the infrastructural and service costs outweigh the benefits? The answers to these questions may not be yes/no, but “up to a point” and “depends on how the different factors interact”. Point is, tax revenue alone, in the short term, and without consideration of expenditures, isn’t a good justification for anything. I say that without even considering the very different character of the types of projects under discussion. On a final note, whatever we decide is the best way to develop the city, we need to consider how we can ensure current residents benefit. Talking about increased property tax revenues to fund schools is somewhat disingenuous if the increased property values necessary to affect a revenue increase force the neediest residents and poorest school children (since the previous post claims we need the revenue for schools) out of the area. @35 Lee, thank you for a well thought out response but you may be overthinking and complicating things a bit. And I am not even going to touch the Pear Street issue since this thread is about the M Street house. But statements like “Are historic buildings worth more or less per square foot? Are neighborhoods with a consistent and/or historic architectural style worth more per square foot? How does “luxury” vs. “affordable” factor in (And, over the life cycle of the building, not just immediately)? ” walks dangerously on the edge of saying… tear down the old to make way for new more modern and cost effective structures because 100+ year old houses are out of vogue. That flies in the face of everything concerning the preservation of historic neighborhoods and structures. That is like saying paintings by Michael Armitage are trending now and those by Matisse are passé so destroy all of the old to make way for the new. Then when the trend passes, the old is gone never to be recovered. We destroy way too many old homes that could be restored and replace those too far gone to be repaired with nonconformist architecture. @34 Hill Runner… When we talk about historic neighborhoods in Richmond it is mainly a radius around downtown and not the whole of Richmond. People who move in should know that there is a completely different set of rules and responsibilities than living in the suburbs. So where is the design innovation exactly? I don’t dislike modern, or even post-modern architecture, but to me this is not attractive. To me it looks more like the sort of public housing they built in the 80s, not “a timestamp of early 2000s architecture.” What self-assured rubbish! On the other hand, it fits right in at Mosby Court. @Eric – I think you missed my point. A previous poster argued that any development that generated tax revenue was a good thing, because the city needs the money for “schools and bikelanes”. Tax revenue – especially short term – alone is not a good indicator of whether preservation or a new project is worthwhile or in anyway useful for funding a specific city program, without considering the other costs that come with new residents or businesses, a project’s effect on neighboring property, and the effect of a mixed or consistent architectural aesthetic on both short and long term property values. I’m of the opinion that historic preservation has greater long term value than tearing down old buildings for much the reasons you mentioned. Once something unique is gone, it cannot easily be replaced, and in the long term something unique will usually gain value. I suspect that preservation will ultimately result in less external cost to the city than new development, especially dense development – bit again, over the long term. I’m less certain about aesthetic consistency/preserving a historic aesthetic. Regardless, there is a drawback – preservation at the expense of density may mean that the value generated by preservation is exclusionary – that space is worth more because there is simply less of it. This means more expensive homes and fewer residents. Whether this is desirable is debatable. In any event, efforts to push up real estate values to raise tax money to fund schools to help low income children are likely self defeating, as the increase in property values may eventually force those children out of the school district. Likewise, Creating more real estate by adding density (essentially, building vertically), but not increasing average property values may result in a net loss to the city if the increased cost of services to new residents exceeds the additional tax revenue. It’s not clear that it’s possible to build your way out. @ Hill Runner. How about a neighborhood that has been destroyed? How about Rocketts Landing? How about North Jackson Ward where there is nothing but empty lots? Tear down Gilpin and you can have a whole neighborhood of these? What about Maggie Walker Place off 2nd Street? How about demolishing all of the Mosby Courts and filling those areas with these houses? Ford Avenue overlooking the valley? Heck, demolish all projects and replace them with these! Even places in Henrico could use them instead of cookie-cutter Ryan Homes houses! Asking that question means you’re not up on future plans or potentially available land. Just look around and not at infill lots that could better be filled with something that compliments its neighbors instead of being abominations that make you wish it stayed an empty lot. The houses are better for more disturbed areas where the historical and architectural context has been destroyed. @39 Cadeho… I sense some tongue in cheek here but truth as well. As I said, the design is a bit too sterile, rigid, lacks any character but so did a lot of the 1950s-1960s house designs which this has a feel of… not 21st century. I am sure it will be a nice house for someone and interiors well thought out but it isn’t something I would buy for myself – at least exterior wise. And I could bet that there is no separate dining room and has light color floors. But yes, we have lost neighborhoods as well. One of Capt. Charles Wills’ houses that his son lived in was as old as ours. It sat on 30th across from the water tank but torn down in the early 1960s for urban redevelopment. Richmond has a track record for not embracing its architectural gems but rather tear them down. For a city with so much history it seems to skirt around it which also hurts tourism – unlike cities such as Charleston or New Orleans. I know in New Orleans, rather than completely tearing down a structure too far gone, they will prop up its façade and reuse it while building new attached to it which maintains the historic look of the street. That mindset is what new infills here should be following. Much of 30th street and neighboring ones are now houses from the 1980s and look out of place. The original houses sat in an area they called Shed Town, which is one of the oldest parts of Richmond but now its history is gone forever. Like Fulton which was once a thriving neighborhood… gone forever but now an opportunity to build modern structures like this, if they wish. I don’t have a background in architecture, but I think one of the points of keeping to the historic style of the existing homes is that there are so few places in this country with the density of old homes that we have here in our neighborhood. If we keep allowing houses built on infill lots to be of another style, them we lose that uniqueness. That uniqueness is makes our neighborhood a real gem and gives our homes extra value. While this house is not my taste, I would not be against it in a neighborhood that already had a variety styles. Whether it is in the historic limits of Church Hill or not, I think it is a shame. When I say “architectural gem” it was a blanket statement because yes, all of our pre 1910s homes prior to the last building boom in Church Hill, should be appreciated for what they are. I am sorry… like East Grace mentioned we have one of, if not the highest concentrations of 19th century architecture in the country. That by itself is baffling as to why the city doesn’t take a bigger part in preservation? But we are right back to where we started. True, this house falls outside of the boundaries (which are outdated and need expanded) so someone could build a house made out of shipping containers on stilts if they wanted to and no one can object. The problem lies where the owner and/or architects have no respect for the surrounding neighbors and try to conform to surrounding architecture as required by the O&H guidelines. If the house falls outside the boundaries, anything goes but if it is within the boundaries or surrounded by them then certain criteria’s should be followed. If Federal, Italianate, Georgian Revival, Colonial or Victorian is not your style of architecture, then you shouldn’t even consider living in a historic district. Church Hill and its surrounding area is only a miniscule part of Richmond as a whole. Eric. It’s not in a historic district. Even if it was, fake historic buildings wouldn’t be appropriate. Proportion–yes. But not fake. You may not like it; that does not make it wrong. @44 Juliellen… YOU are the one who doesn’t get it. I know the house is not in a historic district but it is a matter of principal that apparently you don’t like. I know they can build what they want where “this” house is. But, in historic areas they are to fit in so, if you have a new house going in between two Victorian ones, the new house is supposed to echo what is on either side. Not what they did at 21st and Broad which is an atrocity and was a lengthy discussion about that here. What I was saying is that developers should be more conscience of their surroundings. Sorry, that is part of “preservation” of historic neighborhoods and why rules were written and in place. If you don’t like Victorian replicas going up, then all I can say is that your are living in the wrong neighborhood and don’t embrace the true nature of district preservation. You will always go up against opposition since there has been many people and groups since 1957 who has been striving to keep Church Hill looking old and historic hence O&H districts.